Charles-Louis de Secondat, Baron de La Brède et de Montesquieu (/?m?nt?skju?/; French: [m? 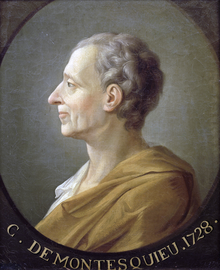 ?t?skjø]; 18 January 1689 – 10 February 1755), generally referred to as simply Montesquieu, was a French lawyer, man of letters, and political philosopher who lived during the Age of Enlightenment. A man who writes well writes not as others write, but as he himself writes; it is often in speaking badly that he speaks well. When we seek after wit, we discover only foolishness. The love of study is in us the only lasting passion. All the others quit us in proportion as this miserable machine which holds them approaches its ruins. Experience constantly proves that every man who has power is impelled to abuse it; he goes on till he is pulled up by some limits. Who would say it! virtue even has need of limits. Politics are a smooth file, which cuts gradually, and attains its end by slow progression. There are bad examples which are worse than crimes; and more states have perished from the violation of morality than from the violation of law. The pagan religion, which prohibited only some of the grosser crimes, and which stopped the hand but meddled not with the heart, might have crimes that were inexplicable. Human laws made to direct the will ought to give precepts, and not counsels. As men are affected in all ages by the same passions, the occasions which bring about great changes are different, but the causes are always the same. In the matter of dress one should always keep below one's ability. When a government is arrived to that degree of corruption as to be incapable of reforming itself, it would not lose much by being new moulded. The mood and temper of the public in regard to the treatment of crime and criminals is one of the most unfailing tests of the civilisation of any country. Vanity is as advantageous to a government as pride is dangerous. To be convinced of this we need only represent, on the one hand,the numberless benefits which result from vanity, as industry, the arts, fashions, politeness, and taste; and on the other, the infinite evils which spring from the pride of certain nations, a laziness, poverty, a total neglect of everything. Great commanders write their actions with simplicity; because they receive more glory from facts than from words. Countries are not cultivated in proportion to their fertility, but to their liberty.